The new paper is actually a combination of special paper and ink. The paper is a multilayer mat of polymers imbued with chemicals that react with metal salts to produce seven distinct colors. The chemicals in the paper are terpyridine molecule ligands that correspond to specific metal ions such as zinc, iron or cobalt. The team also added fluorene to improve the optical properties of the paper. To print onto the paper, the researchers used a standard inkjet printer—its ink was made by mixing the metal salts with an aqueous solution. The researchers report that they were able to erase and reprint the paper eight times before it started to lose its intensity and that the ink remained vibrant on the page for up to six months. They also claim that taking into account the number of times a single page can be used, the cost of printing with their paper would be just one-fifth the cost of printing with a traditional inkjet printer. The group also created a second type of erasable paper that used only regular water as its ink. The paper was made with a multi-layered zinc-ligand complex that reflects orange light when exposed to water. That paper was only able to display one color and it was lighter than with the first method, but the team suggests the proof of concept might be broadened, leading to an even greener way to produce paper. Rewritable paper has recently become prevalent in both academic research and marketplace due to the potential environmental advantages, including forest conservation, pollution reduction, energy saving and resource sustainability. However, its real-life applications are limited by a lack of effective strategy to realize multicolour and water-jet printing on rewritable paper with long legible image-lasting times. Herein, we report an effective strategy to construct rewritable paper based on colour or luminescence switching induced by dynamic metal–ligand coordination. 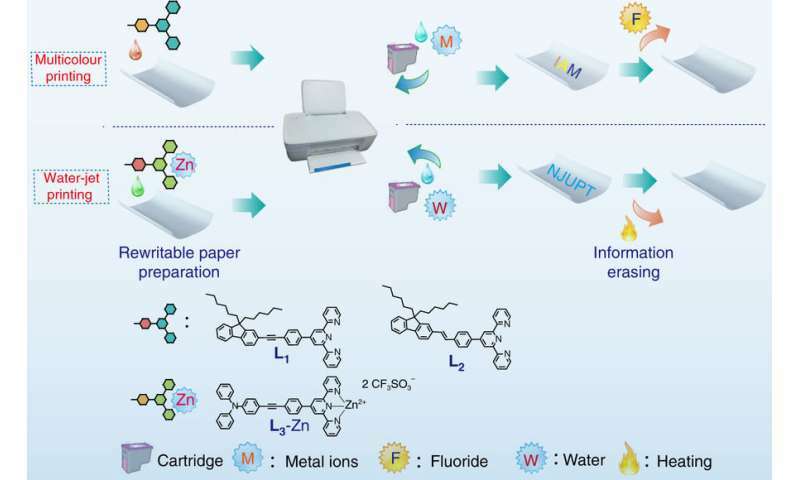 This type of rewritable paper can be conveniently utilized for multicolour water-jet printing by using aqueous solutions containing different metal salts as ink. In addition, the printed images on the water-jet rewritable paper can be retained for a long time (> 6 months), which shows great progress compared to previous work. We believe that this type of rewritable paper could be considered as a prototype for multicolour water-jet printing to meet the practical needs. Wow, how irrelevant is this? I got this thing for Christmas called a RocketBook Wave and after it's filled up, you put it in the microwave with a cup of water and it erases the pages! Apparently the Chinese and whoever published this paper are unaware erasable paper technology already exists and is in the market place. Let's save the planet by replacing wood pulp with petrochemicals. Can prior print be read like a palimpsest ?? The problem is the use case. When people print on paper, they punch holes in the pages to put them in binders, or staple them together, or fold them to put them in envelopes, write on them with pens and pencils, or just damage the sheets otherwise when they're not being carefully protected. Copy paper just isn't precious enough to be handled like it was 7th century vellum. It's a disposable item. So being able to re-print a page is not much of an advantage if the page cannot be put back through the printer any longer. Ooh, and how does it react to coffee-mug rings ?? Doesn't compare well to a whiteboard and dry erase markers either. So, we put lumbermen out of business, eliminating one more high-paying, low-skill job, and end-up costing ourselves way more for paper, erasable or not. Typical modern technology.